Beth and her husband, Scott Gilbert, started weaving about 35 years ago, using honeysuckle vines and white oak. In the early 1980s, they met Ollie and Lestel Childress, fourth and fifth generation Kentucky white oak basket makers. Ollie and Lestel mentored Beth and Scott, sharing not only their weaving skills, but also the culture and history of basket making in south central Kentucky. Beth and Scott were selling their baskets but it wasn’t long before Scott and a friend, Michael Sims, had developed a line of white oak basket handles. 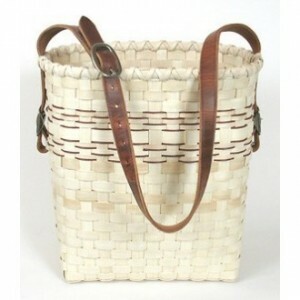 This endeavor lead to a partnership and GH Productions was born, the focus was white oak basketry. They wove baskets and taught anyone who wanted to learn. Then sometime later in the 1980s, they heard about reed realized that many people were interested in learning to make a basket, but not everyone wanted to start by cutting down a white oak tree! And so they began teaching some reed baskets and out of that grew The Basket Maker’s Catalog. 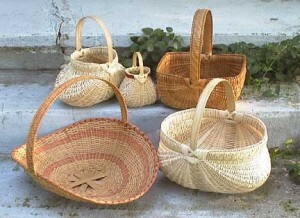 Today the catalog is online, you can visit it here; they continue to make their beautiful white oak handles in the woodshop, sell a wide variety of basket supplies, host nationally known instructors form outside Kentucky, and they have an extensive collection of basketry books – many hard to find. Their business is mostly mail order, but Beth says if you are passing through Scottsville, Kentucky, you are welcome to stop in and shop. And we talked about how technology has connected basket makers, social media has enabled us to connect with people across the nation and around the world. It doesn’t matter who posts a “photograph of a basket – the comments may be in any language but the workmanship, the skill and beauty, we read that like a universal language”. 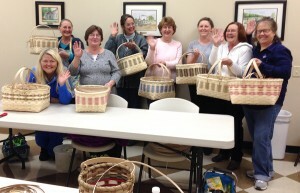 Technology has enlarged our basket making community. How to Make a Mule Skinner Basket – an informative ibook with how to photographs and six videos. Click here to learn more. Kentucky has a rich history of basket makers and traditions; something Beth is passionate about. She is active in the Kentucky Folklife Program, most recently making presentations on Basketmaking Traditions in South Central Kentucky at regional public libraries. You will often find her setting up displays about basket making in Kentucky and working with Kentucky treasures like Leonna Waddell. 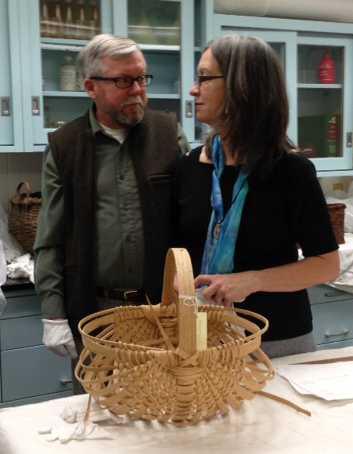 Beth is a guest curator for an upcoming Basket Traditions Exhibit at the Kentucky Museum on the campus of Western Kentucky University. 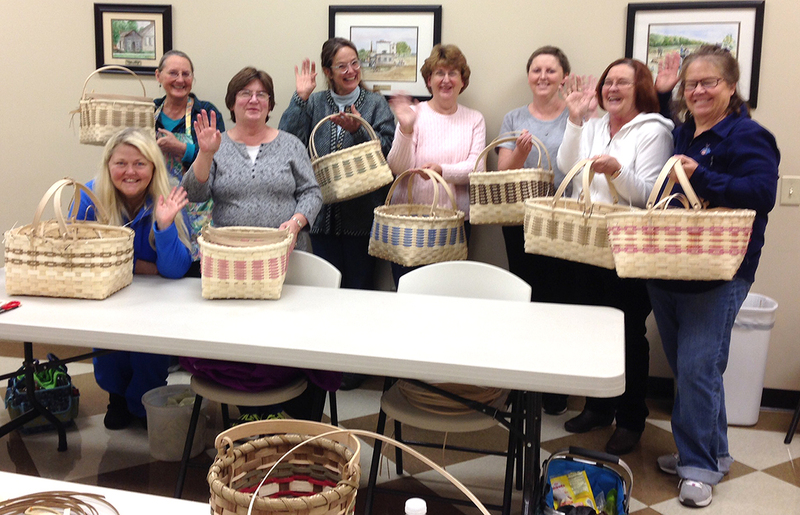 While the basket traditions of south central Kentucky is a main focus of Beth’s work, she is also on the National Basketry Organization board of directors working to promote basketry and basket makers on a national level. I love how baskets grew into Beth’s life’s work and how the simple act of weaving continues to give her so much pleasure. Beth told me she was looking forward to taking some upcoming willow basket classes and she enjoys weaving with a friend. That made me smile…I hope you also are looking forward to taking some basket classes and weaving with a friend. (photo above) Beth and Scott in the collections room of the Kentucky Museum on the campus of Western Kentucky University. The white oak egg basket in progress was made in the 1980s by Walter Logsdon, a traditional basket maker from Hart County, Kentucky.